Design ideas for a small traditional u-shaped kitchen in Hertfordshire with beaded cabinets, white cabinets, white splashback, stone slab splashback, stainless steel appliances, light hardwood flooring and a breakfast bar. Inspiration for a small contemporary l-shaped open plan kitchen in London with flat-panel cabinets, white cabinets, laminate countertops, white splashback, ceramic splashback, stainless steel appliances, medium hardwood flooring and no island. 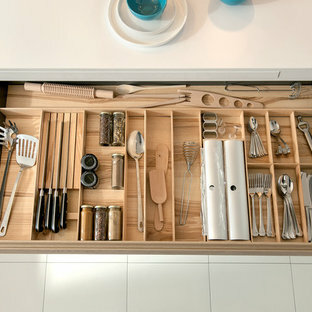 Maximize space with this smartly designed kitchen. With a Scandinavian feel the NEW Portland range is perfect for a small but perfectly formed kitchen. High density particle board finished in melamine to give a matt finish with the look of Indian oak. 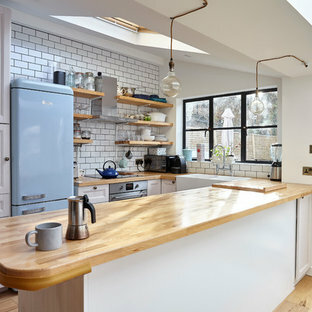 This is an example of a small contemporary l-shaped kitchen/diner in Wiltshire with flat-panel cabinets, white cabinets, white splashback, brick splashback, white appliances, light hardwood flooring and black worktops. 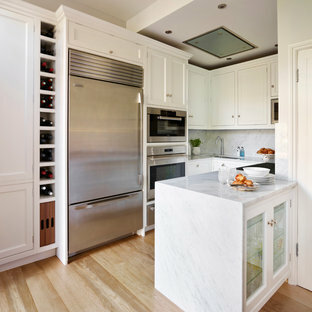 Photo of a small contemporary single-wall kitchen/diner in Other with open cabinets, white cabinets, concrete worktops, medium hardwood flooring and no island. 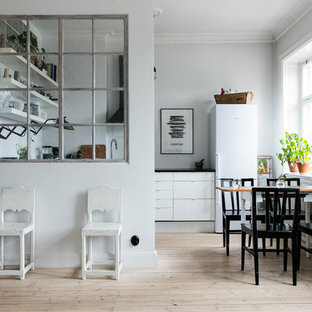 This is an example of a small scandi galley kitchen in London with a double-bowl sink, flat-panel cabinets, white cabinets, wood worktops, stainless steel appliances, medium hardwood flooring and no island. 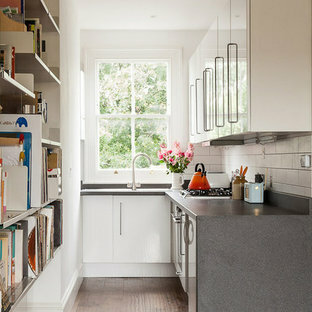 This is an example of a small contemporary kitchen in London. 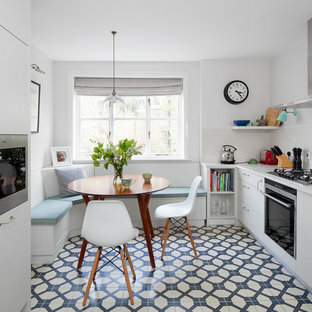 Inspiration for a small traditional u-shaped enclosed kitchen in Other with a double-bowl sink, shaker cabinets, medium wood cabinets, laminate countertops, white splashback, metro tiled splashback, stainless steel appliances, lino flooring and no island. 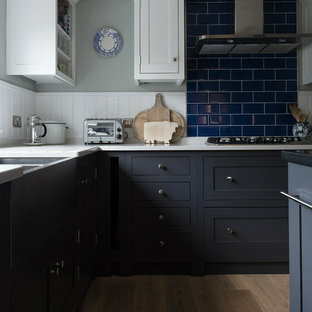 Photo of a small traditional l-shaped kitchen/diner in Devon with shaker cabinets, white cabinets and granite worktops. Inspiration for a small classic u-shaped enclosed kitchen in London with a belfast sink, shaker cabinets, grey cabinets, grey splashback, metro tiled splashback, no island, composite countertops, stainless steel appliances, ceramic flooring and beige floors. 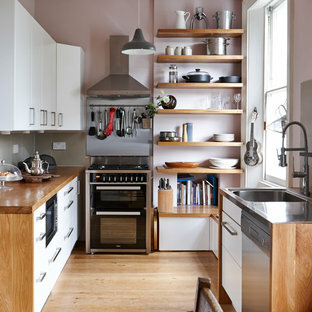 Photo of a small contemporary kitchen in London.